IF , and i said if. 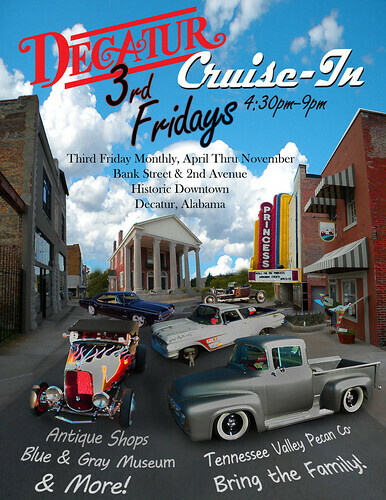 the city of decatur decided to have a monthly cruise in, on bank street. where there are a lot of antique shops for the ladies but only a couple restaurants would you come? need to know soon! as in now!! they will be looking at bringing in other food vendors. it may be held in conjunction with the city's 3 friday. lots of cool parking places.quite a few restaurants back down the street but also a lot of road work at present time in that area. let me know now. tell your friends to look at this and sign in also. need a good count now. they want to pattern this after the GADSDEN CRUISE IN. let me know asap!! It will be like playing in my own back yard. So they're up for it? ba king and I talked extensively with the city of Huntsville only to have some people there can the idea without any real reason as to why. If the city is up for it - then GO. I would go. We looked into Bank Street awhile back (several years ago) for Friday and/or Saturday evenings, but with the 2 or 3 restaurants completely full of customers at that time (5pm after a work day! ), there were lots of cars. No parking in the 3 or 4 blocks of those restaurants. Not to mention it was hard to get into the restaurant and eat in a relatively quick time. Something to think about. Of course, they may not be that busy as they were a few years back. all we got to do is show and give it a try ,and if it dont work out then we pick it apart why it didnt work and what would make it better.our group has been bouncing aroud for months to different places and most ask us to please come back and bring more cars.and B.A can tell you what i am talking about he is there most of the time. I'm in. I'm in. just have it and they will come. gadsden is the same way, you will wait 45-to a hour to eat. but ain't that a great problem to have if you own the restaurant. decatur is just trying to grow downtown. we have a chance to grow with it. Last edited by b.a.king; April 10th at 03:42 PM. yea in a big way so far. seem very positive. i think we could do this next week if we wanted to. Sweet! What do you have in mind for a date? Give me a call when you get a chance. I would like to help get this started. watch for big news tonight. I love it! Added to all the listings.